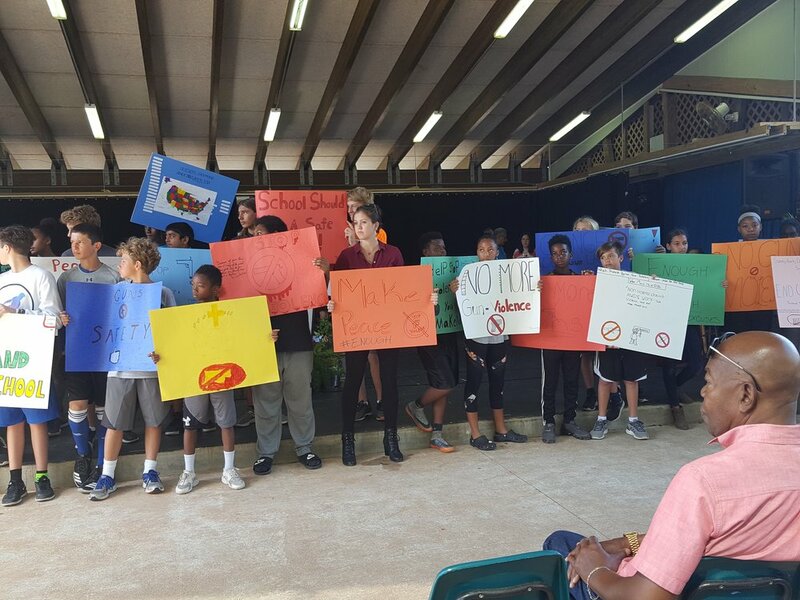 Virgin Islands Montessori School and Peter Gruber International Academy (VIIMSIA) took part in the National Student Walk Out on Wednesday, March 14, 2018. ABC’s Good Morning America has confirmed that out of the 2,500 school participating, VIMSIA would be one of five schools streaming a live feed in Mountain and Central time zones. The #NationalSchoolWalkout, spearheaded by EMPOWER, the youth branch of the Women’s March group that organized women’s marches against President Donald Trump across the country, calls for students, teachers, school administrators, parents and allies to take part in a for 17 minutes at 10 a.m. across every time zone on March 14, 2018 “to protest Congress’ inaction to do more than tweet thoughts and prayers in response to the gun violence plaguing our schools and neighborhoods,” according to EMPOWER. Peter Gruber International Academy (PGIA) students had the choice to participate in this movement or sit out - as it was a student drive initiative. "As a school that values peace, we felt the need to support our students and provide them a platform to voice their concerns - if they so choose" commented VIMSIA's Dean of Students, Michele Weichman. With the support of faculty, teachers and administrators, PGIA students coordinated a peaceful ceremony to pay their respects for the Marjory Stoneman Douglass victims. Almost each student took time to create posters with demands and messages of hope. Seventeen students volunteered to create posters for the 14 students and 3 staff members that were killed during the brutal mass shooting. Throughout the 17 minutes of silence, students called out the name of each victim on the top of every minute and displayed their posters to their peers - many of them mentioned what each student did such as: soccer player, loved the arts, etc. It was a touching way to commemorate the lives of all who passed, and it was evident by the tears and somber faces in the audience. “We commend our students’ desire to exercise their First Amendment right to protest as they stand in solidarity with the survivors of the Valentine’s Day massacre. The Department views this as an opportunity to teach valuable life lessons about government, citizenship, gun control and school safety,” Education Commissioner Sharon McCollum said in a statement Tuesday. Mapp said he supported students who elect to peacefully exercise their First Amendment rights on this issue. 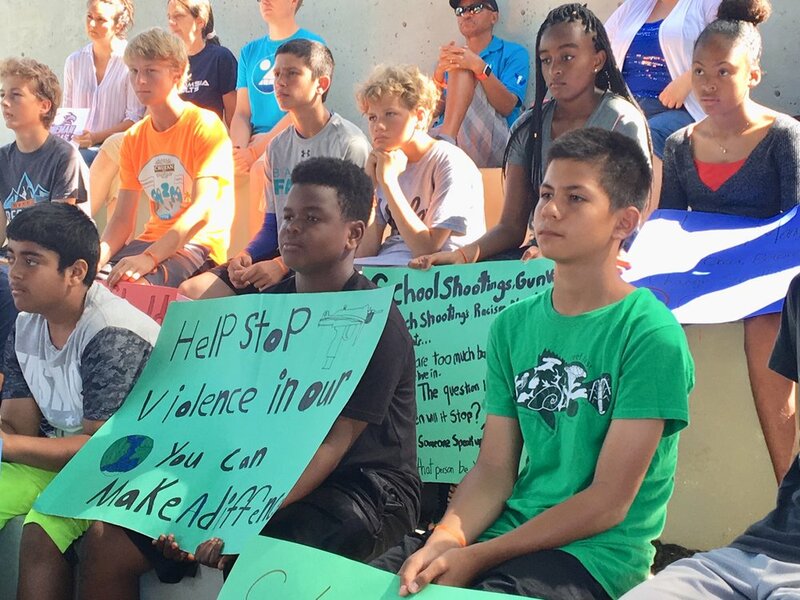 “Sadly, gun violence has become a reality our young people, in particular, must face as victims and witnesses to tragic school shootings, whether in their neighborhoods or on their campuses,” Mapp said. “It’s important that we cultivate civic responsibility amongst our youth and an obligation to the common good is an important part of civic engagement" he continued. VIMSIA students would like to thanks Michele Weichman, Gloria Zakers, Michael Bornn, Pamela Engle, Dianne Love and all the faculty and staff for their support.